PrepsKC and The McCarthy Auto Group are interested in helping your football program. 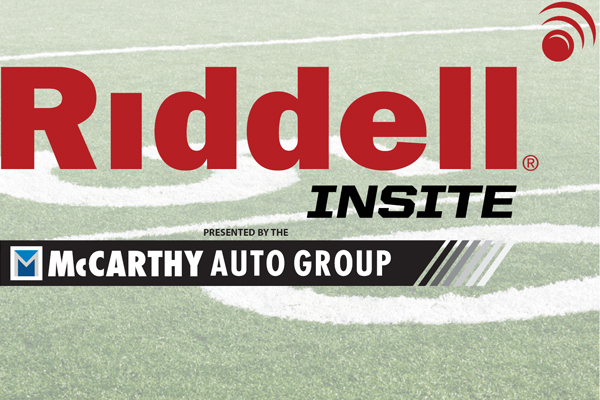 Riddell, the industry leader in football helmet technology and innovation, has partnered with PrepsKC & The McCarthy Auto Group and one lucky school will win twelve (12) new Riddell Revolution Speed Helmets equipped with InSite. The Riddell Revolution Speed Helmet is lined with a custom fit cellular air pad system. Polyurethene and synthetic rubber foam are also used inside the helmet. The shell of the helmet is made up of a polycarbonate alloy. For the lightest weight, a titanium face guard is attached to the helmet. Each helmet will be equipped with the Riddell InSite Impact Response System, an integrated monitoring and alerting tool designed specifically for the proactive protection of football players. Riddell developed InSite based on its Head Impact Telemetry System (HITS) and Sideline Response System (SRS), a technology that has analyzed nearly 2.5 million impacts since 2003. InSite is a helmet-based impact monitoring technology designed to alert when significant single and multiple impacts are sustained during a football game or practice. Coaches and sideline staff will now have Riddell InSite's unique vantage point inside the helmet at the time of contact to alert the sideline staff of a potential issue. Tell us in 100 words or less why your school deserves twelve (12) new Riddell Revolution Speed Helmets equipped with InSite. The contest runs from Sept. 1-30, 2015. Only one essay per school please. Please submit your essay to dion@prepskc.com. Winner will be chosen the first week of October, 2015.